R.E.P. brand fishing lures are not created to attract or catch a fisherman’s visual pallet. R.E.P. Lures are crafted and meticulously field tested with various shapes and color patterns to establish select variations that capture the attention of finicky fish encouraging solid aggressive strikes. and painted one at a time with great care for detail. Proven effective for Musky, Northern Pike, and bass. Made exclusively by D.B.Young Jr, for fishermen that demand the very best. These are not mass production lures like most on the market these days, but are individual works of artistic craftsmanship. Each Woodywog comes with 5 replacement action tails that match the bodies paint pattern. 4/0 Heavy weedless hook for powerful setting strength. 14.00 each / free shipping within U.S.A.
Comes with 5 replacement action tails. 4/0 Heavy hook for powerful setting strength. All Baby Surface Dwellers are equipped with a #4 blood-hook treble. Patterns Perch, Mud minnow and Goldfish come with a brass finish #2 Colorado blade, while the Black Bullhead and Silver Shiner have a #2 Nickel finish Colorado blade. #2 Nickel finish Colorado spinner blade. 16.00 each / free shipping within U.S.A.
#2 Brass finish Colorado spinner blade. These were the lures that started it all. Back in 1970, after I got my very first jack knife, Grandad would sit under the ole willow with me and carve fishing lures. His favorite to carve and fish with, was the Surface Dweller, which I renamed ‘’Grandads Surface Dweller’’ in his honor and memory. Grandad taught me all his dad taught him about lures, and all he himself had learned over many years afield testing designs or colors. Later after Grandads death, I opened R.E.P. 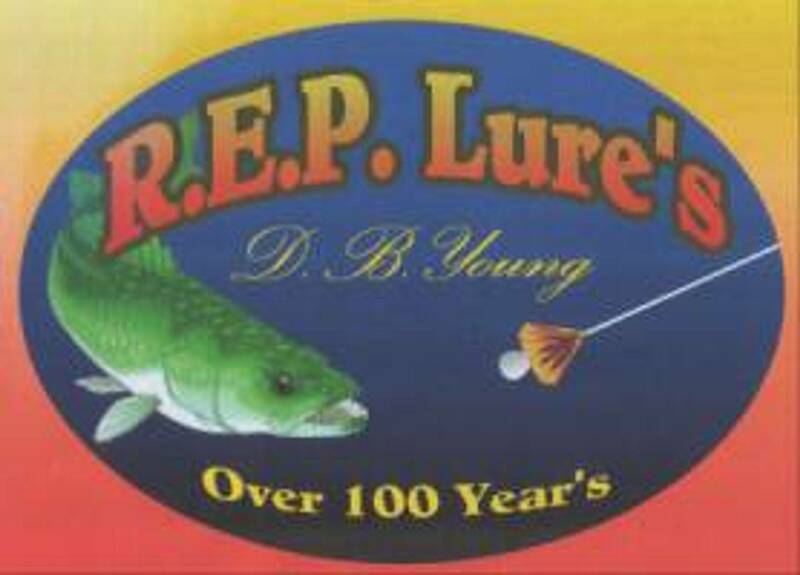 Lures and guide service, in dedication to him. I have continued to carve and offer Grandads style Surface Dwellers in 5 tested color patterns, for Musky, Largemouth Bass, and Northern Pike. For well over 100 years our family has been hand crafting lures or brewing attractants for hunting. 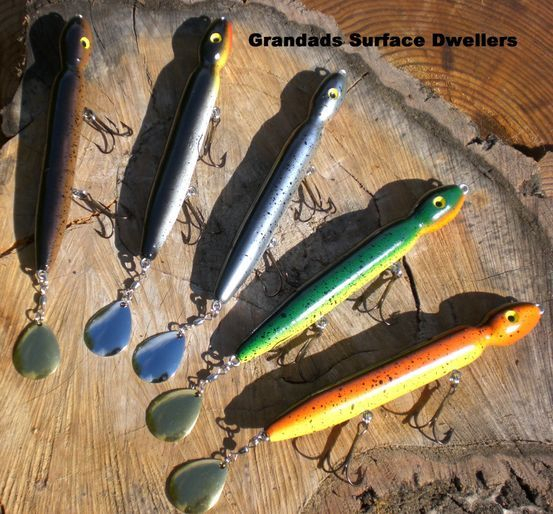 Grandads Surface Dwellers, are 6 inches long, ¾ round with two #1 size Bronze treble hooks along the belly. The Spinner tail is a Colorado blade of Nickel for patterns Silver Shiner and Black Bullhead. Colorado spinner blades are Brass finish for lure patterns, Perch, Goldfish and Mud Minnow. These are the same shapes as Grandad carved, but with my own tested and proven color patterns. Each lure is crafted from solid select wood, and painted one at a time much the same as Grandad did. Old world craftsmanship with modern materials are put into each R.E.P. Lures. Remember, these are handcrafted lures made one at a time, not mass production clones, no two are the exact same, but will still function with deadly attractive action, and D.B.Young tries his best to paint each matching color pattern close as possible. R.E.P. Lures are crafted and meticulously field tested with various shapes and color patterns to establish select variations that attract the attention of finicky fish encouraging solid aggressive strikes. Nickel finish Colorado spinner blade. 18.00 each / free shipping within U.S.A.
Brass finish Colorado spinner blade. Have a specific question about our hand crafted fishing lures? Drop us a line below.